My friend forwarded this from the New York Times, in which self-described secularist Laura Miller explains why she enjoys The Lion, The Witch and the Wardrobe every Christmas, and by extension, Christmas itself. My friend was saddened and disappointed by the writer's wrong understanding of the source of Christmas. For my part, I'm more or less with Flannery O'Connor -- If Christmas is not the beyond-strange act of a Creator breaking and entering His creation, passing as a weak and helpless creature beset by enemies, but instead is only a sort of Hallmark special, a cosmological Thomas Kincaide painting, then to hell with it. 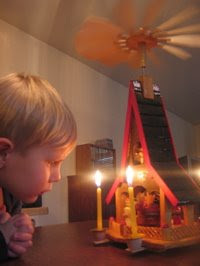 For me, it's the breaking and entering that makes the rest of it -- Father Christmas, the Yule log, even our funny little Chinese-made whirligig Nativity scene, which this year we're powering with Hannukah candles -- make sense. As we all know from history, weather, and science fiction, when one world breaks into another, there's a lot of swirling and mixing, and surprising things attach to each other. No wonder, then, that everywhere Christmas goes, local reminders that winter doesn't last forever get attached to it (and I'm not entering the argument over whether the Roman solar feast arose before or after the arrival of the Christians, because it makes no difference). But if the writer likes the Hallmark-Kincaide-Picadilly smorgasbord aspect of the Holiday Season, then she's welcome to her enjoyment. To me, it's like eating the paper wrapped around the chocolate truffles, but if someone doesn't believe that the truffles are edible or even exist, what can you say to prove otherwise?